“Book? What’s a book?” I’ve been asking myself that a lot lately, and I keep getting different answers — but none so quirky or inventive as the one Tom Abba and Duncan Speakman have come up with in Bristol. Abba, who heads an interactive media program at the University of the West of England, and Speakman, of the Bristol art collective Circumstance, have conspired with the novelists Neil Gaiman and Nick Harkaway to construct a story that starts out as a book but then unfolds as a digital text that people read on their smartphones or tablets. It’s called These Pages Fall Like Ash, and it’s a tale of two cities — cities that exist in the same time and place without, somehow, ever bumping into each other. I particularly liked the idea of publishing this in Medium because it too is an experiment in digital publishing. Started last fall by Ev Williams and his partners at Obvious Corp., Medium is "a collaborative publishing platform" (in Williams's words) that aims to rethink many of the conventions of online media—conventions that in many cases began with Blogger, which Williams co-founded in 1999. Blogging back then was a rarefied activity almost unheard-of outside tech circles; by creating the first easy-to-use platform (one he later sold to Google), Williams changed that forever. But that was a couple of eons ago in Internet years. So why not take what we've learned and start over again, with the idea of getting it right? As Williams has explained, that's the idea behind Medium. In some ways it seems as far-fetched and idealistic as Blogger did 14 years ago, or Twitter after that. But hey—these guys do have a track record, right? Not long after the If Book Then conference in Milan and Stockholm, Neil Gaiman gave a much-talked-about keynote at the London Book Fair in which he too talked about the future of books. Speaking to the international publishing establishment, he made a point that was both familiar and critically important: Change is here, and denial is pointless. "I worry that too many of us . . . are certain that if only we can get 1993 to come back again, we'll clean up. That if we hold our breath and close our eyes and guard the gates with bigger and more dangerous weapons, time will turn backwards and it will be yesterday again. And we all knew what the rules were yesterday. The rules of publishing were simple. Authors, agents, books, incredibly long lunches—that was publishing. Not any more." Along the way, however, he gave some tantalizing glimpses of what the future could hold. Some were quite basic: the idea that buying a physical book might automatically give you the ebook and audiobook as well. Others were counterintuitive in the same way that the study I designed with JWT was counterintuitive: "I suspect that one of the things we should definitely be doing . . . is making books that are prettier and finer and better. We should be fetishizing objects. We should be giving people a reason to buy objects, not just content, if we want to sell them objects." What's a book, anyway? The answer used to be simple: two covers, a lot of words in between, printed on paper and meant to be stored on shelves. Not any more. With ebooks the paper is gone, the covers are vestigial, the shelves are virtual, and the words might be joined by playable videos, expandable photos, interactive graphics, and HTML5 pyrotechnics. The question is not what a book is but what it can be. So it was gratify­ing to spend a couple of days re­cently with people who have smart ideas about this. 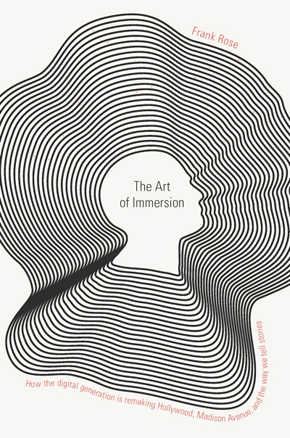 With The Art of Immersion just published in Italian, I was invited to Europe to speak at IfBookThen, a future-of-books confer­ence staged in Milan by the Italian e-publisher Book­Republic and reprised two days later in Stock­­holm by Publit, its Swedish counter­part. Here's what I came away with. "If it doesn't spread, it's dead": With this pithy dictum, Henry Jenkins summed up the nature of media distribution in the Internet age. Introduced as "our new mantra" in a 2007 blog post about Jonathan Lethem and slash fiction, it turned up again as the title of a 2008 white paper from the Convergence Culture Consortium, the initiative Henry launched at MIT to explore the changing dynamics of the media industry. Now it's the central idea that animates Spreadable Media, the new book he's written with Sam Ford and Joshua Green, two former C3 colleagues who have moved on to consultancy roles — Sam at Peppercomm Strategic Communications, Joshua at Undercurrent. In whatever context, this idea stands as a corrective to the distribution model of the broadcast era, which presumes that control will rest with whoever puts the product out, not with the people who are the market for it. The levers of power have shifted. Due out next week from NYU Press, Spreadable Media is an essential read for anyone who wants to under­stand how media works today. The book begins by contrasting spread­­ability with sticki­ness, an earlier measure of online appeal that prevailed during the heyday of "Web portals" like AOL and Yahoo! Sticki­­ness was a Web 1.0 concept that tried to port ideas from the broad­cast indus­try into the Web world — ideas like cen­tralization and pull and pre-structured inter­­activity, as opposed to dis­persal and flow and open-ended participation. But the au­thors take issue with Web 2.0 as well, and they seem border­line ap­palled by the "viral" metaphor that has attached itself to the act of online sharing. Participation, they argue, is not a dis­ease, and should not be treated like one. To do so is to denigrate not just the act but the peo­ple who doing it — that is, us. When you coined the phrase "participatory culture" in 1992, did you have any idea how participatory it would get? I never would have imagined it, to be honest. My understanding of the concept has deepened over time. In 1992, I used "participatory culture" as the subtitle of my book, Textual Poachers, which just came out in a 20th anniversary edition. I was trying to set up a basic contrast between the ways that mass media had created a spectator culture and the ways that fandom was asserting a collective and individual right to par­ticipate within media culture, often through the production of new kinds of works — fan fiction primarily, but also fan music and fan video — from the raw materials that the culture industry provided. My thinking at the time was informed by writers like Seymour Papert, who had described the forms of cultural participation which had grown up around the Samba Schools in Brazil, but my thinking lacked much cultural scope or depth. Some of the most intriguing innovations in story­telling these days are happening in the UK, where broadcasting networks, book publishers, and even newspapers have embraced the idea of creating immersive narratives that invite the audience to join in. The latest effort comes from Matt Locke, former head of cross-platform programming at Channel Four, who left television last year to start Storythings, a consultancy that's been developing projects with top brands and media outlets. Story­things' first project, released last month, is Pepys Road, an online story that ties in with the John Lanchester novel Capital, recently published by Faber & Faber.